An overview of the Profile program, including specimen availability, adequacy, and sequencing success. (A) For consented patients, a cancer specimen is genomically profiled in a CLIA laboratory. Results are tiered by a team that interprets pathology, incorporating information from each patient’s electronic health record and provided to the patient’s treating physician(s). Genomic, pathologic, and clinical data are deposited in a central knowledge base that can link to full clinical annotation. 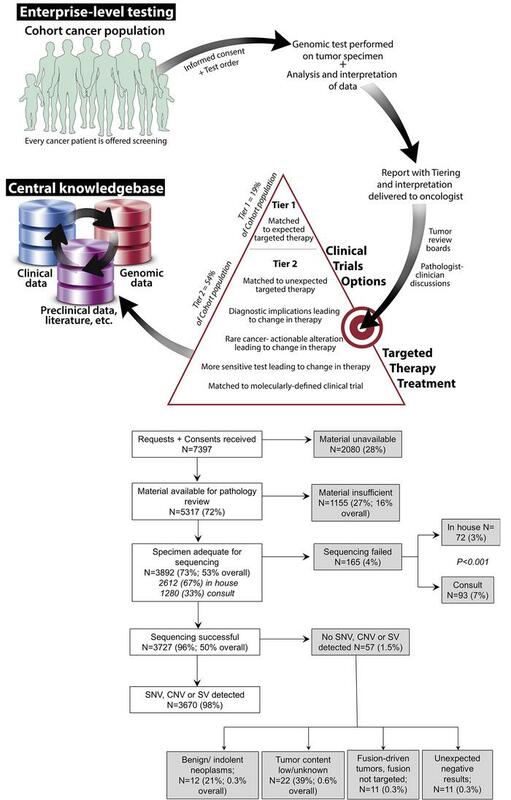 The knowledge base can be queried to facilitate development and enrollment of basket trials and inform tumor board discussions. (B) Once patient consent and a test requisition are received in the laboratory, pathology records are reviewed for available cancer specimens. Unavailable materials are defined as those not physically located within the participating institutions and not actively requested by the treating physician for OncoPanel testing. Cases are most commonly insufficient because material is too small, tumor content is less than 20%, or generates <50 ng of DNA. Sequencing failure is defined as mean target coverage of less than 50 reads. Tumors lacking single nucleotide variation (SNV), copy number variation (CNV), or structural variants (SV) were rare, but 22 were cases with low tumor content. Reported P value calculated by Fisher’s exact test.